Well, congratulations! You have clicked on this article about German pronouns on language-easy.org. Of course, it’s obvious – your Germany must have already reached a great level. So, let’s go into details and improve it even more. German pronouns are an essential part of German grammar, as well as adjectives for example. Well, they are also considered to be rather complicated, as they depend on a lot of other grammatical factors. Hopefully, this article will help you to understand the basic structure and functions of German pronouns. As I have already mentioned, German pronouns can be quite difficult sometimes. 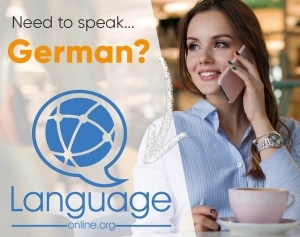 Well, there are various reason, but mainly the difficulties of German pronouns come from their changes depending on different grammatical factors. Here, I have listed some of them. First, there are changes in the form of German pronouns based on the grammatical case which is used. So, depending on whether nominative, dative or accusative is used, the pronoun changes. Second, especially possessive pronouns depend on the the grammatical case but also on the gender of the object. Third, German pronouns change depending on whether they precede a noun or whether they describe a previously mentioned noun. Yeah, I know – all that sounds so complicated. But don’t cry now. 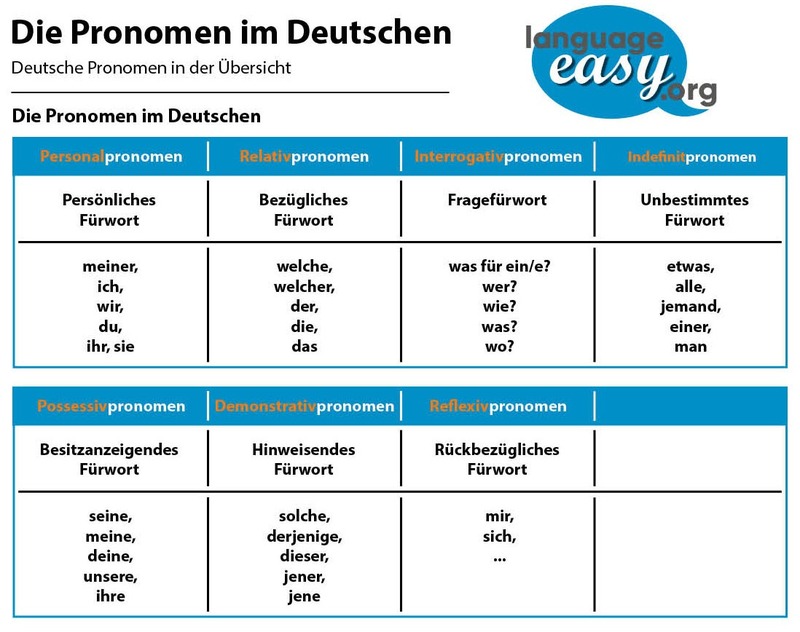 Let’s try to structure and understand the concepts of German pronouns in the following. First of all, we will list some basic German Pronouns. So, you can structure them into Nominative, accusative and dative pronouns. Please, note that we will not talk about German possessive pronouns in this article – it’s a broad topic and I thought, it’s worth writing an article for its own apart from this one. So, this is maybe the easiest part of German pronouns, the nominative pronouns. Well, as you already might have thought, these German pronouns are used as a subject of a sentence. In the following, I will show you a list of nominative German pronouns. Of course, this is total basic German grammar. Nevertheless, you should master it completely in order to go into some more complicated topic. Now, we will come to the next kind of German pronouns, the basic accusative pronouns. So, another very important part of German pronouns are the accusative ones. This kind of pronoun is mainly used when the pronoun is the object of a sentence. But you also have to keep in mind that a lot of accusative pronouns are the same as the nominative pronouns. Here are some examples for accusative German pronouns. “Das Geschenk ist für dich.” – The present is for you. “Sie liebt mich.” – She loves me. Unfortunately, dative pronouns are much more different from nominative than accusative pronouns. So, they are used as the indirect object in a sentence. Here you have a list of the basic dative German pronouns. Of course, here are some examples that illustrate the basic German Pronouns. “Ich geben dir ein Geschenk.” – I give a present to you. “Sie helfen Ihnen.” – They help them. As you might have noticed already, this text is just a superficial overview about the broad topic of German pronouns. In the following you can the different articles on language-easy.org about pronouns in the German language. So, in case you’d like to know some more details about each specific pronoun, just have a click on the corresponding button. Finally, we have come to the end of this rather short article about pronouns. Well, as I have already mentioned, possessive pronouns in German have not been a topic in this article. They are a little more complex than these rather basic pronouns here, so there is an article only about possessive pronouns. Just have a click on this link and it will redirect you to the page about this kind of pronoun. So, I hope you could understand the basic structure of pronouns and also the lists could serve you as important vocabulary. Well, just try to keep the rules mentioned above in mind and you will see that German basic pronouns are far less complicated as you might have thought. Please, note that there is also another article about reflexive pronouns and, of course, about demonstrative pronouns. Just have a click on the links and you will be redirected. By the way, there is a good article on wikipedia about this topic. If you want to have an idea of the overall structure of German pronouns, just have a look on this page.